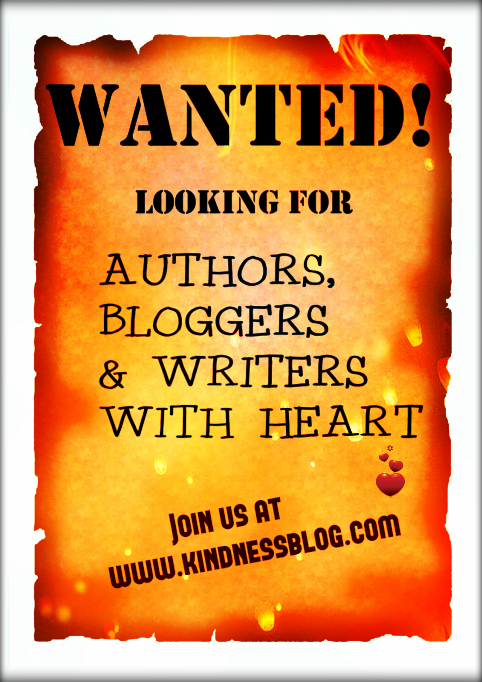 Would you like to join Team Kindness Blog? Currently, we are a small team dedicated to sharing media based on kindness, love, tolerance, self-development and peace. If you are a writer/blogger and enjoy positive media you might want to join our ever-so-friendly-team. We are seeking authors who can and will blog from deep within their heart and from their own experiences. Writers who can lay themselves bare, where appropriate, and be absolutely real. We’re looking for the kind of bloggers whose articles force readers to stop in their tracks and think a while. The kind of writers that speak truth and uplift the spirit or cause people to reflect upon their lives and actions. The type of authors whose words stay with the reader after they have looked away from their screen. Kindness, compassion, mindfulness, forgiveness, family, love, parenting, wisdom, grief, humanity, poverty, self-development, friendship, homelessness, life-lessons, morality, gentleness, non-violence, humility, loss, meditation, random acts of Kindness (RAOK), mental health and gratitude. Please note: Successful articles on Kindness Blog in terms of readership figures and/or responses would, with the author’s blessing, also be put forward to be published on Huffington Post and DailyGood. If you would like to join the team and/or simply contribute your writing for viewing by our growing audience (Over 2.3 million page views received in 2014), please contact us ASAP! If you know someone that might be interested then please share this post using the buttons below. Thank you. Oh I would love to! I would love to and have just emailed you a message. I would love to! I just contacted you all! Love this blog, love this idea and I’ve contacted them. A great way to build your blog and get yourself out there! Very much interested in joining this community.. When and how do I get started?? The response we have had so far has been huge and we’re absolutely delighted! Please do feel free to submit any and all articles, that you feel are applicable to our audience, through our contact page. We will then come back to you ASAP to chat further. I have never blogged before, however, I do enjoy writing. I have found that going out of my way to commit acts of kindness has led to more happiness and strength in my own life. I would be interested in writing articles! I would love to join you & have sent you an enquiry. I think it’s a terrific site & love reading your blogs! Oh my! I would love to! I just contacted you. Fingers crossed! I did send you a piece recently but didn’t see a response.. Please accept my sincerest apologies. We have had some recent ‘difficulties’ with e-mail. Could you resend? I would be interested in submitting some work, but would need a fairly quick response as to whether a piece will be used or not, because if it isn’t, I would proceed to publish on my page. How quick is your turn around of evaluation and response? This could be a fun opportunity to work together. Thanks for the offer and I look forward to continuing the conversation. In answer to your question, usually a piece is evaluated within 48-hours. However, as we are currently responding to a lot of inquiries, it will be a bit of a longer wait. Sounds good Mike, thanks for the quick response! I will review your site and tone / vibe, and reflect on a piece that would work here. Congrats for all of the inquiries and best of luck for 2015. All good here and we look forward to hearing from you as and when you are ready. Hello! My friend and I recently wrote up a piece concerning our experience with a local charity with a global outreach – with a focus on children from Tanzania. We would love to post it here with it’s links and photographs. Would you be interested? Thanks for your consideration!